Buyer: the person firm or company who purchases the Goods from the Company. Company: Building Supplies R Us. These conditions apply to all the Company’s sales and any variations to these conditions and any representations about the Goods shall have no effect unless expressly agreed in writing and signed by a director of the Company. The Buyer acknowledges that it has not relied on any statement, promise or representation made or given by or on behalf of the Company which is not set in the Contract. Nothing in this condition shall exclude or limit the Company’s liability for fraudulent misrepresentation. No order placed by the Buyer shall be deemed to be accepted by the Company until a (written) acknowledgement of order is issued by the Company via e-mail or fax or (if earlier) the Goods are delivered to the Buyer. Any quotation is given on the basis that no Contract shall come into existence until the Company dispatches an acknowledgment of order to the Buyer. Any quotation is valid for a period of 30 days only from its date, provided that the Company has not previously withdrawn it. The quantity and description of the Goods shall be as set out in the Company’s quotation or acknowledgment of order. The price for the Goods shall be the price set out in the Company’s price list published on the date of delivery or deemed delivery. All purchases of Goods for a value of up to ninety five pounds Sterling (£95) shall be subject to a delivery charge of twenty pounds Sterling. All purchases of Goods above ninety five pounds Sterling (£95) have no delivery charge. Subject to condition 3.7, payment of the price of the Goods is due in pounds Sterling and, unless otherwise expressly agreed by the Company, shall be made by means of an authorised credit or debit card payment. If the Buyer fails to pay the Company any sum due pursuant to the Contract, the Buyer shall be liable to pay interest to the Company on such sum from the due date for payment at the annual rate of 4% above the base lending rate from time to time of National Westminster Bank PLC, accruing on a daily basis until payment is made, whether before or after any judgment. The Company reserves the right to claim reasonable debt recovery costs as set out in the Late Payment of Commercial Debts (Interest) Act 1998. The Company will not arrange for delivery of the Goods to the Buyer until the Company has received payment in full for the Goods, unless expressly agreed otherwise. 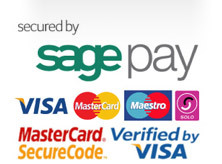 We will accept payment of accounts by credit card subject to a 2.5% surcharge. The amount of this surcharge may be revised by written notice to You including announcements on our website from time to time. Delivery will only be arranged to destinations within mainland UK. Those postcodes not covered are highlighted in the delivery section accessed from the home page. Delivery will occur when the Goods are ready for unloading at the place specified in the Contract or as subsequently agreed in writing by the Company. Subject to the other provisions of these conditions, the Company shall not be liable for any direct, indirect or consequential loss (all three of which terms include, without limitation, pure economic loss, loss of profits, loss of business, depletion of goodwill and similar loss), costs, damages, charges or expenses caused directly or indirectly by any delay in the delivery of the Goods (even if caused by the Company’s negligence). The Company shall arrange for delivery to site on the understanding that there is a suitable road to the point where delivery is requested. If no such road exists delivery will be made to the nearest point to which, in the opinion of the driver, the vehicle may safely proceed and unload. Except for the use of a vehicle mounted crane, the Buyer will provide all necessary labour and equipment required to unload the Goods promptly and will indemnify the Company against any cost claim or damage arising from unloading. A signature on the delivery note constitutes that all materials have been received in good order. It is the responsibility of the buyer to ensure that all goods have been checked and any damages noted to the company within 48 hours. Subject to condition 5.2, the Company may at its discretion accept or reject the cancellation of any order after it has been accepted. If the Company decides to accept the cancellation of an order the acceptance shall be on such terms as the Company may specify. In the event of a cancellation the buyer must pay for the cost of returning the goods. On large items the minimum return charge is £48 per pallet space, for multiple pallet spaces or other items please contact us for a return charge quotation. In any event perishable items such as Cement, Plaster, Plasterboard etc, may not be returned. Where the Buyer is a “consumer“ under a “distance contract”, both as defined in the Consumer Protection (Distance Selling) Regulations 2000, the Buyer may cancel the order within 7 working days after the day after the Goods are delivered. The buyer is responsible for the actual cost of the return haulage which may exceed the cost of the delivery charge initially paid. The Company shall arrange to collect the Goods and once returned in re sellable condition and with all the original packaging in tact a refund will be issued within 7 days. Subject to condition 5.2, the Company may at its discretion accept or reject the return of any Goods which have been incorrectly ordered. If the Company decides to accept the return of such Goods the return shall be on such terms as the Company decides and in particular the Company may charge a restocking fee of 25% of the price of the Goods. Cancellation of an order prior to delivery will incur an 8% admin charge. Where a product is delivered and then cancelled a collection charge, restocking charge and an admin charge may apply. Refunds will be processed on Friday of each week. in any such sale the Buyer shall deal as principal and not as agent of the Company but the proceeds of such sale shall be held by the Buyer on trust for the Company in a separate bank account, the Buyer hereby assigning to the Company all rights and claims it may have against its customers arising from such sale until payment is made in full to the Company as aforesaid. The Company reserves the right to defer the date of delivery or to cancel the Contract or reduce the volume of the Goods ordered by the Buyer (without liability to the Buyer) if it is prevented from or delayed in the carrying on of its business due to circumstances beyond the reasonable control of the Company including, without limitation, acts of God, governmental actions, war or national emergency, acts of terrorism, protests, riot, civil commotion, fire, explosion, flood, epidemic, lock-outs, strikes or other labour disputes (whether or not relating to either party’s workforce), or restraints or delays affecting carriers or inability or delay in obtaining supplies of adequate or suitable materials, provided that, if the event in question continues for a continuous period in excess of 45 days, the Buyer shall be entitled to give notice in writing to the Company to terminate the Contract. If any provision of the Contract is found by any court, tribunal or administrative body of competent jurisdiction to be wholly or partly illegal, invalid, void, voidable, unenforceable or unreasonable it shall to the extent of such illegality, invalidity, voidness, voidability, unenforceability or unreasonableness be deemed severable and the remaining provisions of the Contract shall continue in full force and effect.